So we were cruising out of Des Moines on Day 2 of very successful roadtripping. We were so happy to be riding down the highway together once again, that when we saw one of our favorite brown road signs noting the exit for the Jasper County Historical Society, we decided that the fates were leading us to this stop. 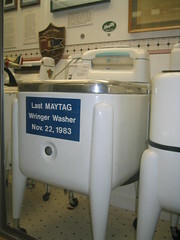 We had enough time and we had seen in one of our guide books that there was a large display of Maytag washing machines here. After making a stop at the restroom (We discovered the location of every bathroom in Iowa due to Kristy's walnut-sized bladder coupled with her pregnancy), we gathered in the lobby with 3 other patrons. An older man reclined in a folding chair while a middle-aged woman collected our money. . . only $5 per person. "I want the young ladies, you can have the others." said the man with the cane sitting in the chair. We blushed and sheepishly watched the other three head off on their tour with the middle-aged woman. We began at a large and beautiful mural portraying the entire history of Jasper County. Mr. Elderly Tour Guide explained every detail of the mural meticulously and kept saying, "Weren't these guys fabulous artists," and then waited for our approval. When we finally finished, about 20 minutes had lapsed. I took a quick once-over at Kristy to see how she was holding up. We then perused the rest of the exhibits. Like many small town and county museums that we've seen across the country, nothing really seemed to fit together or be arranged in any logical order. There were exhibits about Native Americans, geology and fossils, and cars all in the same cramped room. Our very thorough tour guide kept up with his monologue. An hour had passed. Then he said, "Let's head up to the second floor." I was already exhausted from the tour and unlike Kristy, was not incubating another human. "Are you o.k. I whispered?" "Yeah," she said, "Anyway, we still haven't seen the washing machines." Mr. Elderly Tour Guide said that he'd take the elevator and meet us upstairs and then had a change of heart. I guess he wanted to show off for the "young ladies" so he heaved himself up the stairs. The second floor was much more interesting for we Roadchix because it was almost entirely filled with washing machines. There were examples from the oldest machines to the modern day. 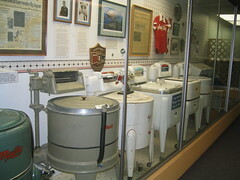 One machine had been designed as a multitasker and had attachments for a butter churn, ice cream maker, meat grinder, and dishwasher! Just imagine. . . you could make dinner and dessert and do the dishes after, all while washing your fine linens!! Although the exhibit was interesting, there is a definite limit on how much can be said about washing machines, so we were relieved to head back down the stairs. . . into another huge room filled with more modern Maytags. Aaaaaaaaaaaaaaaaaaaa! I was about ready to lose my mind. We did our best to hurry our tour guide along (who was in no hurry to leave the company of his "young ladies"). Finally we were back in the lobby. Kristy hit the bathroom. As I waited for her, our guide said, "You should really take a look at our steam engine across the street." "Sure." I said. The middle-aged woman took me across the street (guess it was too much exertion for our other friend), and gave me a brief tour around the steam engine. Kristy joined us for the end of the spiel. Then she said, "We have a whole barn full of interesting things next door!" "We really need to get on our way, but THANK YOU!" I said as I nudged Kristy toward the car. Kristy practically kissed my feet when we got back in the car. . . 2 hours and 10 minutes later. "Thank You for getting us out of there!" she said. By that time, it was too late to hit any other roadside attractions for the day, but had just received the "most tour for our money" in Roadchix history.